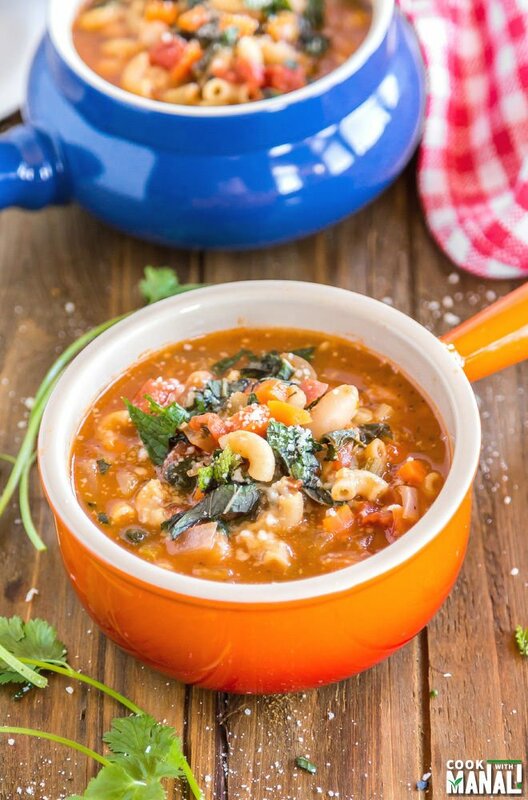 One Pot Vegetarian Minestrone Soup is comforting and delicious. It’s packed with lots of flavors and vegetables! Of late, we have been on a major Italian food kick! I have always liked Italian good, it’s actually one of the first cuisines that I tried outside my (Indian!) food of course. But the Italian that we get in India is very Indian-ized I should say, just like everything else. 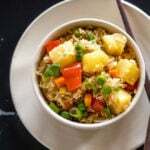 You have Chinese food made the Indian way and Italian is no different. While I love that version too, over the years I have come to love the real Italian food. Hey as real as we get here, I have not been to Italy yet! Few weeks back we were in San Francisco and we ate Italian 4 days in a row! Like at the end of it, even I was surprised. Because it usually happens that when I eat other cuisines for 2 days in a row, I badly begin to crave Indian food. 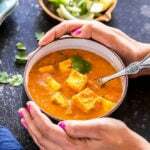 I grew up eating my Indian food everyday so I can’t survive without eating it at least 3-4 times a week. It’s like we eat Thai and Italian for 2 days and then I want my paratha no matter what! So the fact that we ate Italian 4 days in a row without me dying for Indian food was quite strange, to say the least. Anyway so these days we have been visiting this local Italian restaurant a lot. I love their neapolitan pizza crust, so good and what I also love is their vegetarian minestrone soup. There are days when we go there, hubby orders a pizza while I order a big bowl of minestrone. They serve it with traditional ciabatta and it makes such a wonderful meal. Since I have been eating so much minestrone soup these days, I thought I should make it at home. 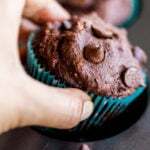 That way I can eat it to my heart’s content and so I did and it turned out wonderful! Is this the traditional recipe? I don’t know I am not Italian so I don’t claim it to be authentic. Is it delicious, big YES! 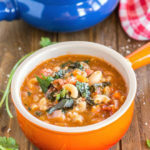 This vegetarian minestrone soup is one pot, super easy to make and packed with delicious flavors. You can use a lot of veggies here, I stuck to the traditional ones like onion, carrots, celery, spinach. 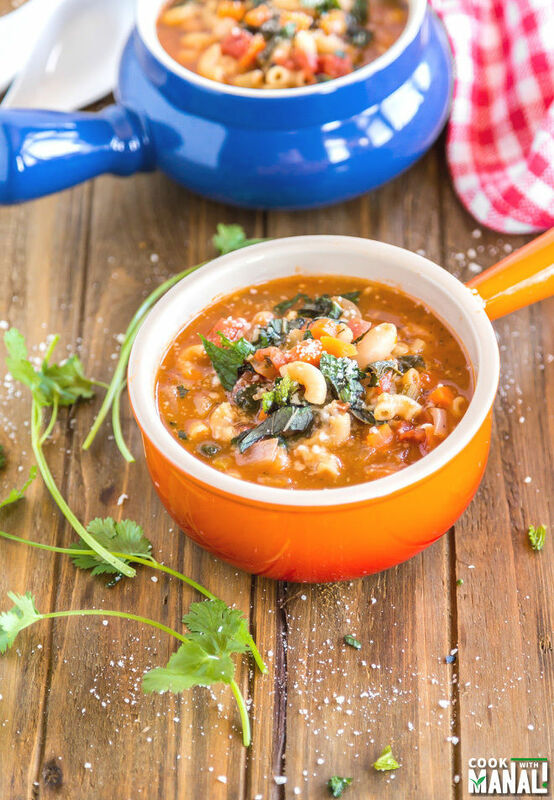 Here are few things which you should do to get that perfect bowl of vegetarian minestrone soup! use elbow pasta: of course using any other pasta would also work, but elbow pasta is just so tiny and so perfect in this minestrone soup. 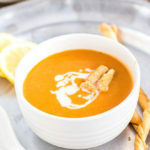 add some parmesan cheese to your broth while cooking the soup: this I actually learnt from the same restaurant that we go to. Once I asked them to not put parmesan on top of my minestrone and the waitress said but the broth has parmesan! I tried that at home, added just around 2 teaspoons of it to the broth and yes it made the soup very flavorful. You may add more! add spinach or kale: personal preference, but I love these in my minestrone. Hope you guys give my favorite minestrone soup a try! It’s super comforting and really a complete meal in itself. Let’s see how we make it. To a pan on medium heat, add olive oil. Once the oil is hot, add chopped garlic. Saute for 30 seconds. Add chopped onions and celery and saute for 2 minutes or so. Add diced carrots and some salt. Cook for another 2 minutes, till veggies begin to soften a bit. Now add the cannelini beans and mix. Add the can of crushed tomatoes and also add the Italian seasoning. Add vegetable broth and mix till everything is well combined. Add elbow pasta, stir and then cover the pan let it simmer for 5-6 minutes. Open the pan, add chopped spinach, black pepper and grated parmesan cheese. Mix everything and cover the pan again. Cook for additional 5-6 minutes or till the pasta is cooked. Ladle your vegetarian minestrone soup into serving bowls and top with some more parmesan cheese. Serve immediately! 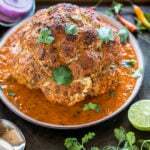 * I like using can of fire roasted crushed tomatoes in this recipe. You can use any tomato of your choice. * You may use kale in place of spinach in this soup. * I used cannelini beans in this soup which is traditionally used. You may use any beans of your choice, even chickpeas would be great! 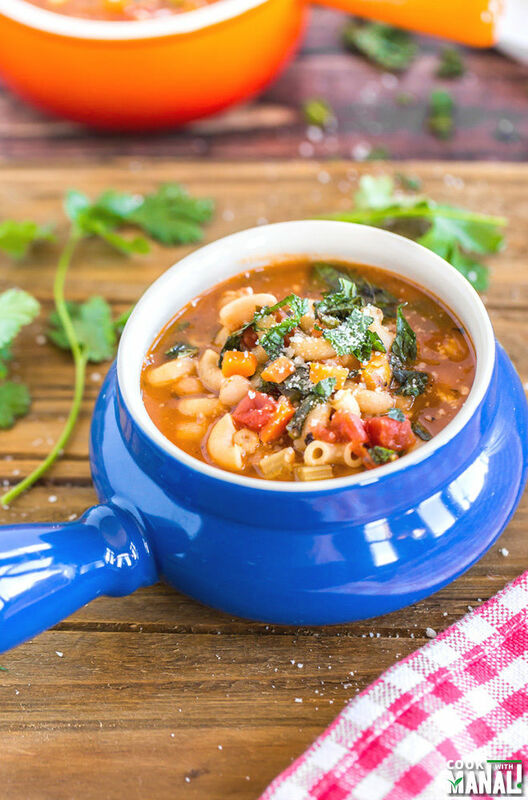 One pot Vegetarian Minestrone Soup is packed with delicious flavors and makes a wonderful meal! This is one of our favourite comforting soups. What I love most about it how you can throw pretty much any veggies in it, so it’s a great way to use up leftovers. This is my kind of soup, Manali! I love that you have fully embraced Italian food. If I had to pick one type of food to eat the rest of my life, I’m pretty sure it would be Italian. A good minestrone is hard to beat…and I love that it comes with a nice piece of ciabatta. Yum! Yes I have come to love Italian food, it sure is delicious! Thanks David! Minestrone is one of my favorite Italian soups!! Love how hearty and filling yours looks! 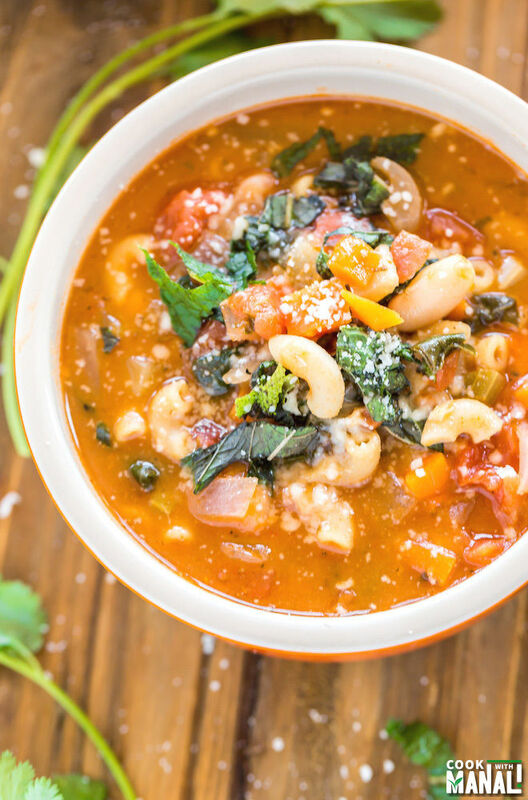 I love soup year round and minestrone is one of my favorites! 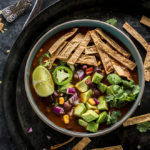 This looks so hearty and full of goodness! 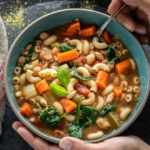 Minestrone soup is one of my favorites! So many delicious flavors and veggies combined..Perfect weeknight meal! skip, its not compulsory at all!